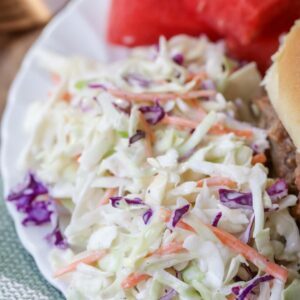 This quick and Easy Coleslaw makes the perfect side dish for any picnic or BBQ. It takes just minutes to put this classic coleslaw recipe together, and it can easily be customized with the spices and flavors you love most. Add all ingredients to a bowl and whisk together until smooth. Toss with your favorite lettuce combo (shredded lettuce, cabbage, carrots, or coleslaw mix). Chill until ready to serve. ENJOY!